Click on the magazine above to read a sample of articles from recent issues. bike tests that take you on amazing adventures, where we challenge the test bikes to the limits of their capabilities. features that bring you inspiring discoveries: secret gravel passes of the Cascade Range, randonneurs in mid-century France, forgotten Japanese mountain roads. 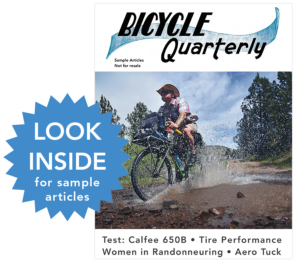 technical articles on the performance of wide tires, frame stiffness and other useful topics that have changed the cycling world.